One week ago today, we announced at Mount Vernon that I would serve in a more direct leadership role with the Upper School, in deeper collaboration and partnership with Krista Parker and Emily Breite, while our school extends the search for our next Head of Upper School. What an incredible opportunity for me to work with the Upper School division, faculty, and leadership as we continue to build a program that achieves our vision for being the best at developing and delivering a 21st century learning experience. Last week, Mount Vernon Presbyterian School hosted a Shark Tank for entrepreneurs who were striving to establish startups in a particular target market in Atlanta. The lean-startup entrepreneurs are 5th Graders! Thanks to the work that Stephanie Immel (@teachingsteph) coordinated and collaborated with Monica Lage from Break Into Business! And kudos to our young entrepreneurs! What amazing experience in real-world context and application of knowledge and skills. How are you being present – being in the present – and playing to connect? On Tuesday, March 4, thanks to Mary Cantwell, Trey Boden, a number of folks @MVPSchool, and the organizers of SXSWedu, I enjoyed a fabulous opportunity to facilitate a Playground Session at SXSWedu, in the “Hands On” category. By playing, we were not preparing for anything in particular or readying ourselves for the future. We were playing to be present – to be in the present – and to connect with our fellow playmates, or learners. We were playing to connect with our inner child, our beginner’s mind, and our innate storyteller. We were playing to #HaveFun and thread connections among ourselves and others. Like kids on a playground. Like we did when we were immersed in our own childhoods. At the end of January, Shelley Clifford and I attended a Creative Mornings Atlanta. 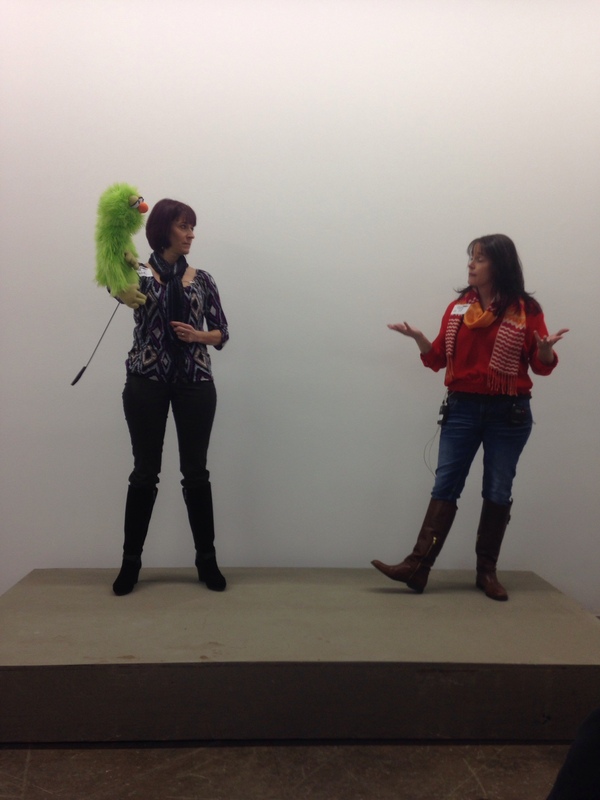 The theme was “Childhood,” and we heard Aretta Baumgartner and Patty Dees speak about puppetry arts as a way of reconnecting with our childhood — being fully present and playing to connect. As Aretta captivated us all, she strung us together in a game that put us in the role of puppets. And our biggest challenge was to BE PRESENT. To let go of our egos and to simply enjoy playing. During the #SXSWedu Playground session “Mount Vernon Plays to Connect,” we reiterated this point about the power of play — there is great energy and fun in being present and being in the present. Amidst the joy of doing so, we connect to a great many things, and, more importantly, to a great many other people. When we play, we are like children embracing their childhood — playing to learn, playing to connect, and playing to…play. Be present. Be in the present. Embrace your childhood. Connect. Go play. Innovative school seeking innovative leader. Mount Vernon Presbyterian School is accepting applications for the position of Head of Upper School (Available June/July 2014). Head of Upper School reports directly to Head of School and collaborates with Chief Learning and Innovation Officer and School division leaders. We are a school of inquiry, innovation, and impact. Grounded in Christian values, we prepare all students to be college ready, globally competitive, and engaged citizen leaders. Established in 1972, Mount Vernon Presbyterian School, serving 900 students in preschool through grade 12, is located in the heart of Sandy Springs, Georgia within the metropolitan Atlanta area. Located on the 30-acre Glenn Campus, the Upper School (grades 9-12) student body has more than doubled in size during the last five years and is projected to exceed 300 students in 2-3 years. We are building something exceptional here. The School is in the midst of a new era of exploration and innovation, under the guidance of an energized staff, Board, and faculty leadership as well as committed and connected families. As an outward expression of our inward passion, the 2012-2017 Strategic Plan is driven by a fundamental MVPS question: How might we innovate school to meet the needs our students and our world? The School has been aggressive in launching key programs to position our students as realizers of our mission: Mount Vernon Institute for Innovation(MVIFI), Mount Vernon Mind, Council on Innovation, Center for Design Thinking, Innovation Diploma, Interim international travel opportunities, transdisciplinary education capstone project, College and Work Readiness Assessment, Write Now, and //fuse to name a few. cultivating and nurturing strong relationships within the School community–students, faculty, parents and other partners. designing a vigorous, relevant, and innovative learning and assessment map for each Upper School learner–students, as well as faculty. employing a variety of evidence-based and innovative approaches and methodologies in order to engage and motivate students of this generation. exercising an innovator’s DNA–observing, questioning, experimenting, networking, and associating. providing professional learning opportunities supporting individual staff needs/organizational goals. co-chairing Research & Design (R&D) teams. developing partnerships with corporate sector, non-profit community, and civic organizations. researching, identifying, and advancing innovative programs. retaining and attracting high performing teaching candidates. overseeing the day-to-day operations–schedule, meetings, events, calendar, and facility spaces. Interested candidates should send a cover letter, resume, and link to professional portfolio to employment@mountvernonschool.org. It’s fascinating to me how many schools have discussed for years such topics as “21st Century Education,” “Blended Learning,” “Virtual Learning,” “Online Learning,” “Digital Learning,” “Connected Learning,” etc., yet when a would-have-been-in-school-anyway Tuesday turns into a snow day, so many at the school see the day as a day off from school-connected learning. Perhaps it’s due in some way to the language one’s school uses. For sure, a #Snowcation communicates a very clear cultural expectation about the relevancy of school-connected learning when the school people don’t actually meet in the same physical space because of some winter-weather occurrence. On the other hand, to say that “learning is open” even if school is closed communicates an altogether different way of believing. As Peter Block said, “All change is linguistic,” and a school community’s language – even in the seemingly small moments – can either promote the status quo or dynamism. Perhaps it’s due in some way to the culture of innovation that’s been created and nurtured (or not) at one’s school. I mean, after all, a snow day is a day to kick the feet up and forget about school, right? Because that’s the way it’s always been. Or it could be an opportunity – a #Snopportunity – for a school that’s deeply invested in leading into the future of education — to “ooch” (as the Heath Brothers describe it in Decisive) some possibilities and prototypes for school-connected learning, even when the school community is not gathering at the same physical campus for the day. Of course, when a school regularly practices design thinking and iterative prototyping, it becomes relatively easy to see a snow day as a chance for extraordinary research and experimentation – all in the “ordinary” way that the school usually approaches windfall chances to learn and create and enhance common practice. Such has become a part of the school’s (Innovator’s) DNA. And for a school that not only pays attention to the research and development of educational practice, but also contributes to it, it comes as no shock or surprise that the future of education is about learning flows and not just the physical campuses of school houses. So, when a snow day occurs, such a school sees and seizes opportunities to further a deepening understanding of how school and learning can be brought even closer together as ever-eclipsing Venn circles. I feel genuinely blessed to serve at such a school. And I feel an obligation and responsibility to share our practices – the practices of an entire community of professional learners, innovators, and extraordinary educators. High-value communication and collaboration happen regularly within and among the divisions at Mount Vernon. And the educators act as a team, moving strategically together. So, when the decision was finalized to close the school campuses for Tuesday and Wednesday, the Division Heads and Directors of Teaching and Learning distributed communiques to the faculty. Below is one such message from our Upper School Dean of Academics and Director of Teaching and Learning. I trust you have seen the news that Mount Vernon’s buildings will be closed tomorrow and Wednesday in the interest of safety. However, as Tyler outlined in his earlier email, we will still treat these days as learning days with the expectation that our students be demonstrating their learning and that we be available to support them as they do so. 1. Students will continue with learning exercises and assignments that teachers have posted on haiku by 8 am on Tuesday morning at the latest. Those can be due virtually while we are away or can be due when we return to school. Given that most of the ice is expected on Tuesday evening (from what I hear), it may make sense to have some work due to you by the end of the day Tuesday. 2. For each day that we are away from the building, teachers will hold two face-to-face sessions through Google Hangouts for 5-10 minutes for each of their preps at some point before noon to communicate about the learning plan for each day and to answer student questions. Holding two sessions will allow us to handle the capacity of Google Hangouts (15 people can hangout together at a time) and minimize conflicts for students. If you have a special situation that would prevent you from being able to engage with students for 5-10 minutes a few times each day, chat with your Head of Grade and me about a solution. One idea might be to make a little video (capture is one app you can use) to give students an overview of what they’ll be doing and then being accessible via email. A little bit of face-time is the goal. Below is Mikey’s how-to video for facilitating Google Hangouts and he sent a few from Trey just a few minutes ago. Thank you for all of your efforts to help us make use of these days. Stay safe! Even before the above messages were fully crafted and sent, other internal communications at Mount Vernon were bouncing around to provide support and coordinated understanding around our approach to this #Snopportunity. In case of inclement weather, Google Hangouts On Air are a great tool for connecting with students virtually. I have created three video tutorials around Hangouts On Air and a video on the general philosophy of Hangouts and the classroom. As always let me know how I can help. For more insight into one of the many Google Hangouts facilitated by MVPS faculty, see the On Air GHO from Trey Boden and his Transformational Leadership class, and read the feature in the Atlanta Journal-Constitution. Because Mount Vernon regularly employs the MiddleburyInteractive program to create a blended learning environment for world language instruction, student learners were able to engage various elements of their language acquisition, just as they do when they are in the school house. Screenshot of a small portion of a thorough Schoology post from a Spanish teacher. In a recent leadership podcast from Andy Stanley, Stanley details the importance of striving for clarity in the face of complexity. One way Stanley explains that a complex organization can promote clarity is to “orchestrate and evaluate” – to routinize certain processes and procedures while being diligent and committed to constantly evaluating and bettering those routines. For my sons, in first and third grades, school-connected learning at home (a.k.a. “homework”) benefits from the routine of Schoology. (As noted above, the Upper School uses an LMS called Haiku.) Each week, long before Monday, my sons’ teachers post the week’s homework outlines and expectations. Because of this technology-enhanced routine, we could continue on today, even during our #Snopportunity. We are a School of inquiry, innovation, and impact. Grounded in Christian values, we prepare all students to be college ready, globally competitive, and engaged citizen leaders… Even on snow days! As you have heard, school is closed, but learning remains open! We are excited to share some learning opportunities for you and your child to enjoy together. Reading: Read your fantasy book and log your reading. You should be reading a minimum of 30 minutes each day. Read with your pencil in hand to help process the story’s information. Jot down major ideas, happenings, plot twists, character strengths, etc. as you read. Bring your notebook back to school to share with your reading partner. Writing: Write out loud! “Story tell “ your final totally made up fairy tale to a parent, sibling or friend. Remember to use your storyteller voice thinking about what your characters are saying and doing. Plan through the beginning, middle, and end of your story. Use your parent as a writing partner! What feedback can you glean from them? Spelling: The students have a prefixes study guide in their homework folders. They should be reviewing the meaning of a morpheme, prefix and base word. They should also review our weekly red words (iron, honest, honor, guess, guest, guard). Complete the Prefix Word Hunt with your family. Brainstorm words that begin with dis, un, pre and in/im. Please bring the word hunt back to school to share with your classmates. Please continue to work on multiplication and division facts with flashcards, iXL and other sites like www.iknowthat.com. Finish either making your “low resolution” prototype or drawing. Remember to add length measurements so we can get the right scale. Bring in drawings and/or prototypes. And because the faculty are well-practiced in connected learning, they are accustomed to online-enabled interactions with the children. For example, when the art teacher Ms. Kat posted this #Snopportunity for drawing, I so enjoyed watching my email notifications “light up” with the conversation threads happening among Ms. Kat and her students as they traded stories and coaching about what they were drawing around their houses. Of the 145 faculty and staff at Mount Vernon, about 120 are users of Twitter. So, a snow day does little, if anything, to deter the connected learning and communication among our community of educators. By searching the hastag #MVPSchool, you can see some of the interactions and exchanges that have happened as collective habits of minds engaging this #Snopportunity. As another example, you could peruse a Storify that details another #CarpeOpportunity moment two weeks ago during the snow and ice that hit Atlanta during the last days of January. “Snow Days Turn Into E-Learning Days for Some Schools,” EdWeek, January 31, 2014, accessed via e-newsletter February 15, 2014. “Classes move online when schools close,” Atlanta Journal-Constitution, February 13, 2014, accessed February 15, 2014. “Snow Day Thoughts for Educators–and Parents, Too,” Peter Gow, The Interested Child, February 13, 2014.